Welcome to November’s update and especially to those who have joined recently. There’s a lot happening as ever so straight down to business. As ever if you need advice, help or assistance with personal casework or any other issue we’ll always do our best to oblige. Please do feel free to contact us – details shown below. Last Tuesday 11 November, I met with Andy Warrington – Service Director for Highways at County Hall, West Bridgford to discuss a wide range of issues that people in Kimberley and the surrounding areas have been raising with me over the past few months. I’m promised a response on all of the above matters shortly. As soon as there is any more information I will let you know. A huge thank you to all of you who got in touch about this issue during the last few weeks. Both Cllr Andy Cooper & me were overwhelmed with the amount of correspondence we received from local residents on this issue. 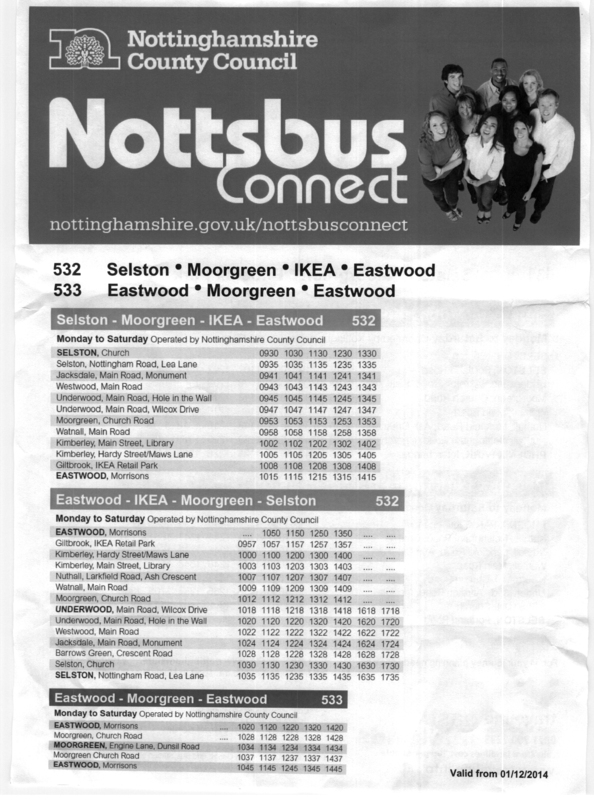 You may recall that Trent Barton announced their intention to totally remove the 27 bus service from Maws Lane area. We launched a massive campaign – with your support, in order to try and find an alternative solution. On behalf of Andy and myself we would like to thank the Eastwood & Kimberley Advertiser, local resident Russ Saxton, Cllr Sue Cooper & other members of Kimberley Town Council for their hard work during the past few weeks. Nice to be able to report a favourable outcome, and this just shows what the power of a good people first, community driven campaign can achieve. Many of you will remember the Oxylane planning application which was refused in December last year. Since then representations from UK Trade & Investment (UKTI) have been made to the council in terms of the £900m investment that Oxylane’s French parent group intend to make in the UK on 30 different sites (with Broxtowe always having been considered the first and showcase model). Incidentally amongst other things UKTI work with overseas companies to look at the UK as the best place to set up or expand their business. With all this in mind on Thursday 16 October 2014 at the Cabinet meeting Broxtowe Borough Council we considered whether support should be given in principle to a new joint planning application for the development of a new leisure centre within the Oxylane sports village complex (see link below). I’m delighted to see that this was approved – and that now a new joint planning application in association with Oxylane will be submitted to the council for consideration by the Development Control Committee. We are expecting a new application from Oxylane to come to the council shortly. As soon as there is any more information I’ll let you know, in the meantime if anyone has any questions do get in touch. This was a new item I introduced for the first time last month. Thanks to all of you who’ve responded with supportive comments It appears from the feedback I’ve had, that I should have used this previously, and that there are a lot of people cross with the Lib Dems locally. This month I want to pick up on previous remarks made by BroxtoweTory MP Anna Soubry where she went to considerable lengths to attack members of Kimberley Town Council accusing them of mismanagement earlier this year. In particular she stated “my concern is that the council’s reserves have all but been spent and councillors are consistently denied financial details”. She continued “I have already written to the district auditors and will take up allegations with the Broxtowe Borough Council’s legal department“. However, the auditors have now reported their findings on Kimberley Town Council, and far from all the reserves being spent, found that a total amount of £261.781 (304% of its precept) in the black. I would like publicly therefore to ask Anna Soubry to make a full apology to members of the public in Kimberley and to Kimberley Town Council. I am aware that her office receive this newsletter (so there really is no excuse for an apology not to be forthcoming). It would be good to receive this before Christmas. What’s on: Craft stalls, homemade cakes and jams, Christmas decorations, jewellery, gifts, bric-a-brac, raffle and refreshments. A request has been received from British Telecom to remove the telephony equipment from the telephone box on Cliff Boulevard, close to the junction with Norman Street. The Community Heartbeat Trust has applied to adopt the telephone box so that a heart defibrillator can be fitted. Broxtowe Borough Council has the opportunity to either support the proposal or object and issue what’s called a “local veto”. We’ll be debating this matter at Broxtowe Cabinet on 25 November. If you have any points, comments you’d like to raise, for or against, or any questions, please let me know before next Tuesday. 7) What’s on at Rumbletums in November? “All men should be feminists” An open discussion around this assertion. Admission Free. Open to men and women alike! An informal meeting for dementia sufferers and their carers. Activities, games and mutual support. Rumbletums will be open from 530pm to 8pm serving hot drinks, mince pies and bacon sandwiches. Our traditional seasonal fair offering a range of craft items and gifts, including Fair Trade food and gifts. Self Help Nottingham, in partnership with Macmillan, has developed a new project to provide support to anyone living with a cancer diagnosis in Nottingham, Mansfield or Ashfield. The project is currently in its initial stages and is recruiting and training volunteers. The aim of this venture is to help those who have had a cancer diagnosis at every stage they will face, including aftercare. Sarah Cadwallader, project coordinator, believes that this work will give those diagnosed with cancer an extra support network and the opportunity to find help that may not otherwise have been available. This project intends to work with clinical care by providing an additional, supporting compassionate service. I hope to have more news on Tram extension Line 4 phase III to Kimberley, Eastwood & into Amber Valley and also the cinema proposal for the Giltbrook Retail Park area in January next year. Want to help in campaigning for Nick Palmer, Labour’s parliamentary candidate in Broxtowe? Contact: Nickmp1@aol.com for more details. Patient, friendly and reliable driving instructor based in Kimberley. Rumbletums also runs a Parent and Toddler group each Tuesday from 1.00pm to 3.00pm and has two large meeting rooms available for hire. Rumbletums now opens at 9 30 every morning at 2a Victoria Street,Kimberley(on the corner of Victoria Street and Newdigate Street, opposite Kimberley Parish Hall). Phone 0115 9384953. I’m a local author living on Victoria Street, Kimberley. I’ve just published a children’s book which is an historical adventure based around Kimberley, Awsworth, Cossall, Ilkeston and Nottingham Castle in the year 1086. Book Title: KINMERS LEA – which is the old name for Kimberley. SHORT OF CASH? Sell your broken gold jewellery at Mike’s7 James StreetKimberley– Established 30 years. Watch batteries/straps fitted. Jewellery repairs undertaken. Wide selection of Gifts available. We also have Toys! Call in for a friendly, old fashioned, service. This entry was posted by Richard Robinson on November 19, 2014 at 13:28, and is filed under Newsletter. Follow any responses to this post through RSS 2.0.Responses are currently closed, but you can trackback from your own site.